Samarkand - Crossroad of Cultures is an over 3,000 years old city located at the crossing of trade routes in Central Asia. It became prosperous as an important centre of silk trade in the 2nd century. During the 14th century, it emerged again under the rule of Timur the Lame. 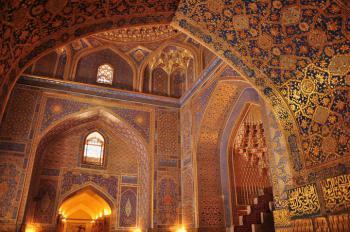 Its Timurid architecture became a worldwide influence in Islamic art and architecture. Samarkand is the site of the iconic Registan - the "sandy place" surrounded on three sides by Timurid madrasahs. You can sit on a bench on the fourth, open, side and take it all in: the turquoise tiles, the slender minarets, the imposing facades. The place attracts a lot of Uzbek tourists too. The madressahs can best be admired from the outside, as their interiors are completely taken over by the souvenir business. Only the middle (Tilya Kori) is worth a visit for its completely gilded interior including golden mosaics. 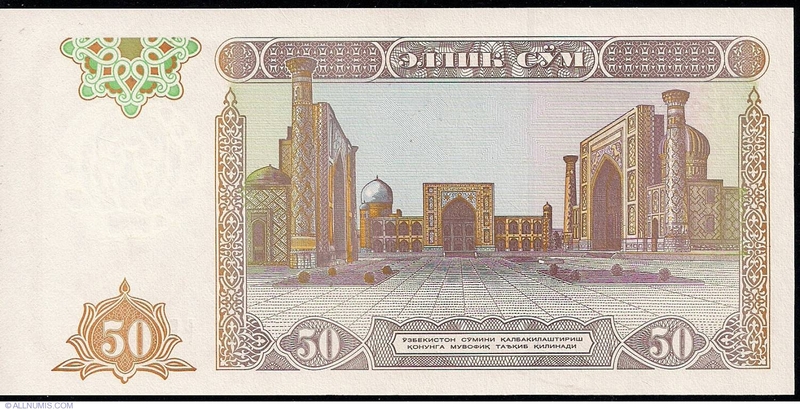 Somehow it had escaped my attention before that Samarkand has several other grand monuments than this Registan. Probably the best sight of my whole Uzbek/Turkmen tour was Shah-i-Zinda. This is a mausoleum complex, where the tombs are housed in the most ornamental little buildings. They feature all the mosaics and glazed tiles Samarkand is famous for, but on a more touchable scale than at the Registan. The place is also full of Uzbek pilgrims and daytrippers, creating a lively atmosphere (imagine visiting this wonderful site on your way from grocery shopping - I saw many Uzbeks carrying their round breads with them). The tomb of Timur (Gur Emir Mausoleum) is the third site worth mentioning. On the inside it has the feel of an European cathedral, with the tombs in the middle under a cupola and older Uzbeks praying around it. There are other notable monuments, for example the Ulughbek Observatory which now is closed for renovation. Besides the Timurid monuments the nomination also covers the archeological site of Afrosiab and the 19th century Russian quarter. Samarkand as a whole is very much a Russified city without much "Silk Route" atmosphere. I visited this WHS in June 2017 over 4 days. It certainly is one of the best destinations in the world and certainly one of the top WHS on the list, not only for the exquisite beauty of all the single inscribed locations but also for the incredible ensemble this place must have been when constructed! That said, I believe that Samarkand should be immediately put on the WHS in danger as the 'modern' and unprofessional patchwork of restorations/reconstructions risk ruining if not destroying the gems of Registan. That would certainly have a much stronger effect than delisting Shakhrisyabz as Uzbekistan's tourism is mainly based on Registan's allure. If I were to post the mortal sins I've photographed from Registan, I could easily have a negative impact on their tourism which is heavily dependent on European travellers. Instead I sent a letter to UNESCO and ICOMOS and I hope that they will take swift action to address such shoddy restoration works in the future. Still, the 3 madrasahs of Registan alone would be worthy of inscription and are hands down one of the best sites the WH list has to offer. At night, if tour group/agencies pay around 1000 dollars (so I was told), a sound, light and laser show is put up - this equipment has led to some of the shoddy restorations! If you're not so lucky (or if like me you cherish visiting without too many tour groups, no show most probably means less people around), still the madrasahs are fully lit and worth visiting. The Registan ensemble has undergone some significant changes lately. The Soviet style 'mosaics' near the viewing platform has been changed with white marble (not so wise as it is very slippery in rainy conditions, extremely hot in sunny conditions). All the fruit trees and soil in the main 'square' have been removed to be able to host fashion shows, concerts, festivals and have an unobstructed view of the madrasahs. Moreover, the square is roped and fenced with guards blowing their whistle to any trespassers who haven't paid the 13 euro ticket which grants access to all the Registan ensemble till sunset. After sunset there is a separate night ticket. Strangely enough there is no 2 or 3 day ticket as most visitors stay for just one night! In the Ulugbek Madrasah you can haggle hard with a shop vendor to let you up one of the leaning minarets for an incredible panoramic view of the Sher-Dor Madrasah and Registan ensemble in general (best light is in the afternoon just before sunset). I managed to go up for about 5 euros but he usually charges around 10 euros! Try to visit during weekdays as the climb up the minaret is very claustrophobic and there isn't space for more than one person up there. The WHS of Samarkand is not only Registan though. It is a never-ending list of incredible buildings and sites with sublime Islamic art and architecture. I would suggest at least 3 full days to explore (and re-explore) the sites at different times of the day and at leisure. All of them are really worth it. Instead of the several 4 or 5 star hotels, I specifically opted for the Bibi Khanum B&B for its incredible location. Every morning I loved having breakfast with a panoramic view of the Bibi Khanum Mosque and Mausoleum (morning light is the best light). Further on from the Bibi Khanum Mosque is another breathtaking site, the Shah-i-Zinda Ensemble (morning light is best to gaze at the shining turqoise carvings and tiles, while afternoon light is great for pictures of the domes from the cemetery). The old necropolis has 3 main highlights: Shodi Mulk Oko Mausoleum, Shirin Beka Oka Mausoleum and Kusam Ibn Abbas Complex. The latter seems quite modern and rather plain from the entrance but if you head inside you will immediately notice that it is the where all local pilgrims head to. I was surprised to see female Islam preachers praying here. The site is dedicated to Kusam Ibn Abbas who is believed to be one of the first missionaries of Islam in Central Asia (bottom left photo). Further ahead from Shah-i-Zinda are the remains of the ancient settlement of Afrosiyob. There's not much to see on the muddy and dusty hills apart from some ongoing excavation works. 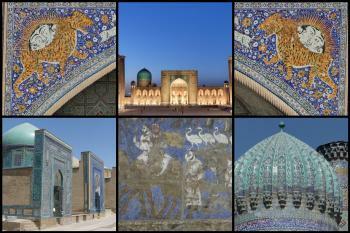 The true highlight is to be found in the nearby museum where there is the recently restored 'Painting of the Ambassadors', a masterpiece of the centre of the Sogdian culture (bottom middle photo). Other worthwhile inscribed sites are best visited by taxi (very cheap). The Ulugbek Observatory and museum is now open. The underground quadrant still bears embossed astronomic calculations in arabic script and other engravings on its arc. It reminded me of my visit of Jantar Mantar in India but what is incredible is that Ulugbek's calculation of a year is the closest to our calendar year with a margin of error of only 1 minute and 2 seconds! No wonder European travellers used to travel here to learn more! Last but not least, the Amir Temur Mausoleum, Gur Emir, has an incredible interior which you shouldn't miss. Do read up before and after visiting these wonderful sites as there's so much to learn and discover here. Samarkand is the reason why I decided to visit Uzbekistan, when I booked the ticket at Uzbekistan Airline office; I saw the poster of the very beautiful Registan so I asked the travel agent that should I trust the poster? The agent immediately said "You will see the better one at the real place!" After that Samarkand became the paradigm of my Uzbekistan itinerary. I arrived Samarkand in the evening, the traffic congestion greeted me with unexpectedly surprised, after a peaceful week in Khiva and Bukhara, Samarkand really reminded the chaotic life of modern urban! 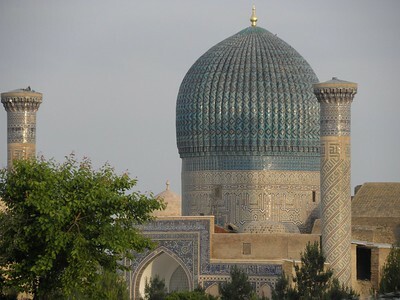 I started my city tour at the Gur Amir Mausoleum, the resting place of Tamerlane; for exterior the beautiful blue mosaic dome was just amazing, and for interior the golden mosaics inside the building were just breathtaking, and in my opinion one of the most beautiful Muslim mausoleum I've ever seen. After the mausoleum, I went to Ulughbek Observatory, a ruin of very impressive ancient observatory, its museum was nice; however, many insightful information from my guide made me question the accuracy of the exhibition and object displayed. Then I continued my trip to see the famous Registan. With high hope and excitement, I found all magnificent three buildings complex to be exactly what I wanted to see, there facades were just magnificent with bright and colorful mosaics. However I was deeply disappointed with the bad status of the interior mosaics and glazed tiles inside the courtyard, seem that Uzbek used their whole money to maintain the outside of the buildings, except the gilded ceiling of Tilya-Kori madrassah was truly outstanding and truly one of my favorite of Registan complex. Then I saw Bibi-Khanym Mosque, claimed to be the largest mosque in the ancient time. Its gigantic size and tiny details of mosaic were impressive. Later I went to Shah-i-Zinda complex, the royal necropolis of Tamerlane family. The complex was just truly beautiful with beautiful mosaic art that maybe better than the Registan. Also with its modest size, I could see more details of mosaic and glazed tiles easier than other places and that made me really loved Shah-i-Zinda for its superb quality of art. In my travel life, I never seen a place that so colorful with mosaic and glazed tiles that similar with Samarkand before except the famous Gaudi's work in Barcelona and the royal temples of Bangkok, but they were totally different arts and should not be compared. Also its history behind were also interesting with countless of legends of the Silk Road and Tumarid dynasty. For me, Samarkand was truly the world class site and one of the most enchanting UNESCO world heritage sites I ever visited. Even if you are not a great lover of Islamic architecture these are all well worth seeing/experiencing. If you go with a guide beware of the “shared ticket price” scam! In theory you are allowed to return to any of these buildings several times during the day of the ticket – but you need to show the ticket! However you may find that the guide and ladies on the gate do not issue a ticket (many tourists will not ask or care) and share the money the guide has available. We weren’t able to persuade the ladies to issue a ticket but we did make sure that they would let us in again later that day! 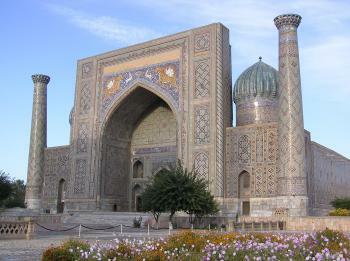 Samarkand is undoubtedly one of the great “destinations” of the world. From "Samarkand - Crossroads of Cultures" to "Samarkand - Crossroad of Cultures"
Alexander the Great: He conquered it in 329 BC. Shia Islam: Shrine of Kusam ibn Abbas. Cousin of Mohammed. Situated within the Shah-i Zinde complex. The name Shah-i-Zinda (meaning "The living king") is connected with the legend that Kusam ibn Abbas, the cousin of the prophet Muhammed was buried there. .. He came to Samarkand with the Arab invasion in the 7th century to preach Islam. Popular legends speak that he was beheaded for his faith. But he took his head and went into the deep well (Garden of Paradise), where he's still living now." (Wiki). Practice of Shia Islam is severely constrained within Uzbekistan but this site is listed in Wiki under "Holiest sites in Shia Islam". Built in the 13th century: "The historic town of Samarkand illustrates in its art, architecture, and urban structure the most important stages of Central Asian cultural and political history from the 13th century to the present day". Registan Square was identified as the centre of the new city after the destruction of Afrosiab in 1220. Its heyday came with the Timurids in the 14th and 15th century. 114 Community Members have visited.